To learn more about our work in South America visit http://aguayaku.org _______________________________________________________________________________________________________________________________________________________________________________________________________ A few images from in and around Samaipata, Bolivia. Please vote for this gallery if you feel so inclined. Thanks for looking around. I recently paid a short visit to this town. Your images capture the essence and atmosphere so well. I loved it, and my grandchildren loved playing in the waterfall! Thankyou for sharing these pictures. Beautiful mixture of Bolivian scenes, Well done! We, Ben Verhoef and Susanne Lijmbach, are surprised by your beautiful photos of Samaipata. You have an eye for details! It's nice to find our Bar/Restaurant La Oveja Negra in the collection as well! Congratulations with your gallery, we love it! My name is Trent Wauson...my wife Chary and I own La Posada Del Sol, a slice of heaven in Samaipata. Your photos amaze me, and I see the sights every day. Just want to say...wow! I am a Bolivian but I never being in Samaipata. My wife and I are considering to retire and move to Samaipata and have the blessings to enjoy with our own naked eyes all this Paradise. Que fotos mas hermosas. Te agradezco por mostrar mi pueblo al mundo. Thank you, your photos are lovely. My son is on his way now and I wanted to see what Samaipata looked like and luckily I found your photos. Wish I was there too! Recently visited Samaipata with my daughter who lives in Bolivia. We enjoyed a wonderful evening of singing in the plaza...thinking of it fondly and googled. I discovered your site and so appreciated seeing your photos. They brought back wonderful memories. Youre a great fotografer..I really love you pictures! And im actually on my way to there next week! Keep up the good work! Beautiful pictures! I spent some time in Santa Cruz a few years ago, we went to Samaipata for long weekends. This really brought it all back! Thank you for the photos. I am looking for an organic farm near Samaipata, called Ginger's Paradise -have you heard of it? Excellent fotos. My wife, Gladys, was born in Samaipata. I'll surprise her with taking a look at your fotos with her soon. I enjoyed viewing this gallery. You took many great shots! Daniel, thats for the pics. I am going to Samaipata in 3 weeks, and am excited to see first hand the beauty you captured so elegantly. Welldone. Your photos of Samaipata are awesome, and it brings back alot of memories! 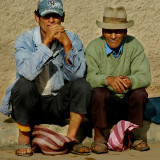 I sure miss Samaipata, and Bolivia in general! These pictures are so beautiful. My son lives in Samaipata with his wife and daughter and the pictures tell the story of this beautiful little city. Fantastic images. I visited Las Cuevas in about October 95. Absolutely stunning. There is a "hidden valley" which I took photos of, which is found (as I recall) an hour and a half or so walk upstream from the entrance to Las Cuevas. We camped below this hidden valley, at the confluence of two streams that feed the waterfall nearer to the entrance of Las Cuevas. The valley, which is full of trees, is "hidden" as, whilst visible when climbing the neighbouring slopes, is unsafe to climb into (without equipment), due to the steepness of the terrain. I am trying to find it on Google Earth, without success. Anyone who knows where I am talking about, let me know. These photos make me wonder why I ever came home, after serving in the U.S. Peace Corps in Samaipata from 1992-3. They are GORGEOUS! Thank you! I was an exchange student to Bolivia in the late 70's. I visited Samaipata twice, once with my classmates and once with the other American exchange students. It is so wonderful to see such great pictures of a place I remember so fondly. Stumbled over your photography whilst looking for places to stay in Samaipata. These are awesome images - really amazing. Looking forward to seeing you before too long. Fantastic pictures. I would liked to see pictures from Zona Sur Achumani. Keep up the good pictures . I will be taking my own soon. I'm moving back to La Paz after 37 years away. Now I'm going to recover and discover my own country. Fantastic picturesI would liked to see pictures fron zona sur Achumani. I'm moving back to La Paz after 37 years away. Now I'm going to recover and discover my country. So grateful for those pictures, especially "the cool kids;the third from the left is my granddaughter, Richica, whom I don't see so often, me living in Belgium. The gallery offers a very toutching view of Samaipata, Omanike, La abuela de la Richica. You've got my vote! Absolutely beautiful!!! Knockout and magic.... are the least of word to describe what I feel when I see this wonder ! idd Richica van Ham-Roca it is! That is what I hate about Pbase - so many brilliant pictures of so many nice places on Earth - still drooling. Life is too short to visit them all. Very nice photos. Aaaaaah!! Third on the lift, if you care. I'm still dazed by this great discovery. Sorry, the third kid on the right. Thanks so much for the photo of the kids in Samaipata (and the other great photos as well). Pure coincidence, that I saw this, but the second kid on the left is the daughter of a close friend. You really brightened up my day. Daniel this is a stunning gallery! I am so glad I saw it. I really need to visit Bolivia.